I'm loving the brightly colored cords that are popping into stores for fall. I can tell the crimson cord is replacing the pale pink jean and so on, all tones becoming deeper and more textured for the legs. I'm all about it! I happened to have a corduroy skirt from many years ago and thought it would be a nice introduction into fall, as we're now at summer's end. Tights, a button down shirt, and a sweater will be even cuter next month but I'm loving the heat too much to wish it all away just yet. In other mommy news, well, I'm feeling a little sad. Parker begins school in just one more day and while it is equal parts awesome and troublesome, I'm feeling those sweet summer wheels slowly grinding to a halt. Ugh! But we have made so many incredible memories over the past 3 months, my grandparent's stay being the best of them, and it's all just as it should be. My G&G leave in 2 short weeks and to celebrate the end of their time in the US with us we have my little sister back again. It'll be a wonderful and nostalgic couple of weeks. I love the colorful cords too, I just picked some up at Target, they are on sale right now! 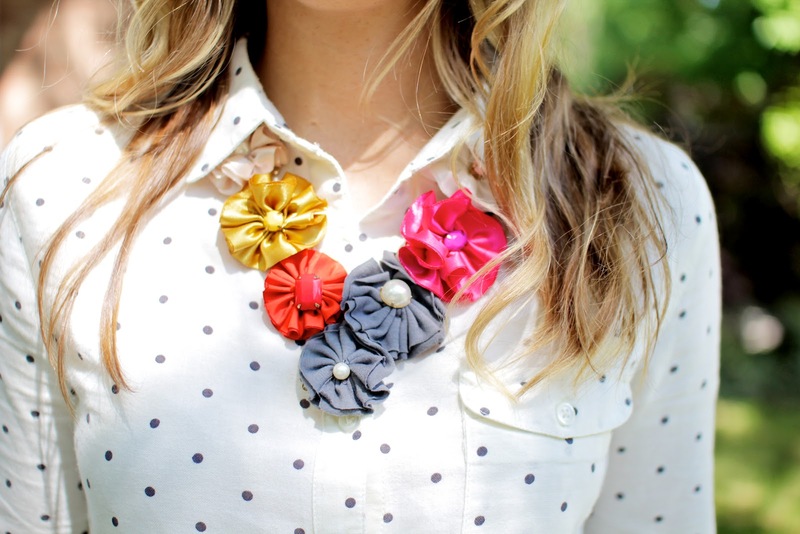 Love the flower necklace. I discovered your blog when your beautiful home was featured on Design Mom and I just love checking in on it now! Sounds like a fun summer! And your outfit is so cute!